Our philosophy at Akad Orthodontics is simple! We believe in providing each patient with the highest quality and most up-to-date orthodontic care in an old-fashioned, friendly, personalized environment. 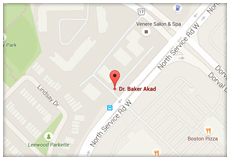 Orthodontist Dr. Baker Akad and his professional team take pride in improving the personal appearance and the oral health of our patients. Akad Orthodontics incorporates a wide range of cutting edge orthodontic treatment options available today including state of the art clear and metal braces, Damon Braces, Invisalign and Invisalign Teen – the “braceless” alternative for straightening teeth, and invisible braces behind the teeth called lingual braces. We excel at being attentive to our patients’ individual needs and customizing treatment based on each person’s unique situation. We understand the importance of self-perception and the boost of confidence which results from a healthy, beautiful smile. Our goal is to provide affordable, high-quality treatment that fits your budget! We offer non-interest payment options to meet your family needs. Your time is valuable, and we respect that. We offer convenient office hours including evenings and weekends, extensive use of modern technology for fast, effective treatment, and our team is always available when you have questions or need assistance. We run “on-schedule” so that you can too! We strive to maintain an environment that is focused on quality, mutual respect, excellent results and having fun. We take our work seriously, but we do it in a fun way to make your experience with orthodontics a pleasant one. When you’re ready to take the next step toward orthodontic treatment, please contact orthodontist Dr. Baker Akad at Orthodontics in Oakville, Ontario at (905) 849-8500 for your FREE orthodontic evaluation and get ready to start smiling! Also serving the surrounding areas of Mississauga ON, and Burlington ON.